Luxembourg's Grand Ducal Family is super busy this weekend with the Octave celebrations et al but they still found time to squeeze in another engagement in their busy schedule. While Grand Duke Henri and Grand Duchess Maria Teresa attended a church service this morning, Grand Duke Jean visited Fetschenhaff to open the new FNEL home. The 92 years old former head of state was accompanied by his grandson and future head of state, Hereditary Grand Duke Guillaume, and his granddaughter-in-law, Hereditary Grand Duchess Stéphanie, finally wearing some colour (that's all I'm going to say about her outfit). 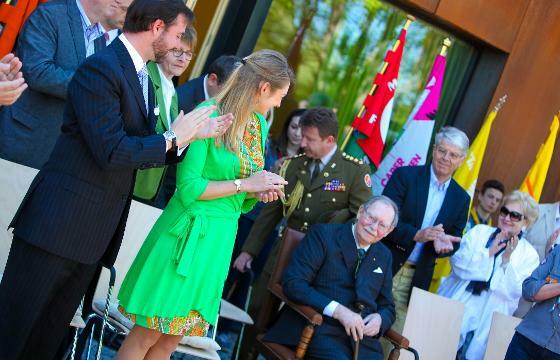 Grand Duke Jean has been the chief scout of the Luxembourg Boy Scout Association for decades and it's great to see him attending this inauguration event of the new home of the Fédération national des Eclaireurs et Eclaireuses (FNEL). Many more lovely visuals of the event are located at Wort in German, Wort in French, the cour grand ducale and RTL. RTL also has a video report about the opening.